Project VIP is a fresh new spin on shows dedicated to animals through the vision of Kathleen Dudley. Project VIP is designed to reach a broad audience with the intent to educate people on a wide range of pet topics, as well as entertain them with local attractions and inspiring stories. With a show to educate the public/viewers on pet ownership, Kathleen believes fewer pets would end up being discarded and sadly euthanized. Kathleen’s involvement in companion animal rescue began in 2003 after a visit to an animal control facility to adopt a dog. “I was shocked to see so many wonderful dogs and cats sitting in cages, all facing the unfortunate fate of euthanasia for no reason other than being lost or unwanted,” says Kathleen. 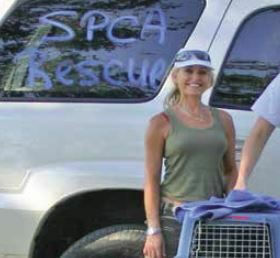 Since 2003, Kathleen has extended her rescue efforts to dogs and cats around the country and spent a week rescuing abandoned / lost pets in New Orleans after the Hurricane Katrina disaster. She has rescued thousands of dogs, as well as many cats, and has found that there is such a tremendous need for knowledge regarding pet ownership, care, and basic pet education. “I receive hundreds of emails every month from shelters and rescues requesting help for dogs and cats in need, as well as pet owners in need of advice on how to find their lost pet or re-home their current pet,” says Kathleen. Project VIP will air on KPLR, St. Louis Channel 11 starting Sunday, July 31st and will run through September 25th, after which KPLR may option another 10 shows. Additionally, St. Louis affiliates, have expressed interest in placing Project VIP in their fall lineup of programming. Feature Story: An informational and entertaining segment that features a wide range pet related topics, businesses and local attractions. VIP – Behind the Velvet Leash: A high-profile person and their pet will be the stars of this segment. VIP Person: Highlights a local person and their work to help pets in the community. VIP Vet: Helpful tips and health information from a veterinarian. Swag: Showcases pet related items, accessories and boutiques. VIP & the City: Features what’s going on around town that is pet friendly or pet related. Adoptable Pets: Showcasing adoptable dogs and cats from local rescue groups.